The Cortijo is a beautiful old farmhouse, once the domain of a large finca and sadly abandoned and now restored to its former glory with much care.The entrance is from the long , cobbled terrace overlooking the white village of Albunuelas nestling below.The terrace is an ideal venue for an evening drink under the shade of the gargantuan centuries old Aleppo pine tree especially at sundown. 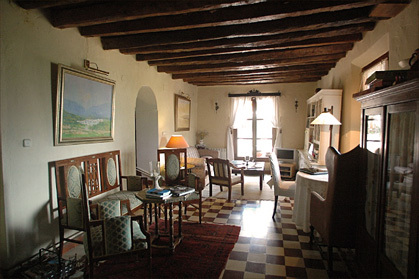 The sitting room is located on the ground floor, a long room off the terrace and furnished with taste and practicabitity, combining rustic decor and period furniture, paintings and the windows framing picturesque scenes of the valley and gardens.Many facets of the original building have been left intact - the terracotta floor tiles and the wooden beamed ceilings. Leading off the salon is the dining room with the fireplace and an art deco dining table seating up to 10 persons and a modern, well equipped kitchen opening on to the rear patio. The patio is filled with flowers and aromatic plants and the table under rose covered pergola can seat up to 12 persons comfortably ideal for "al fresco" meals in Spring and Summer. The barbecue may be used except in high summer. The pool ( 8 X 4 mts ) is gated and heated by solar panels with view over the valley. 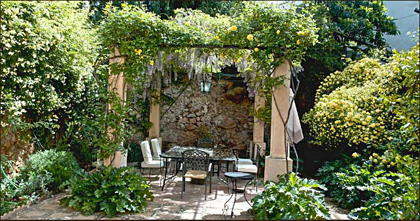 The old gardens have been recovered and extended and have distinct zones - the romantic garden around the gazebo replete with thyme , rosemary, scented roses and jasmin and , on a different level a grassy area around the pool with cypress trees, myrtle and lavender and stairs lead down to orange and lemon groves and a vegetable patch with courgettes and pumpkins. Centrally heated by gas and electricty. 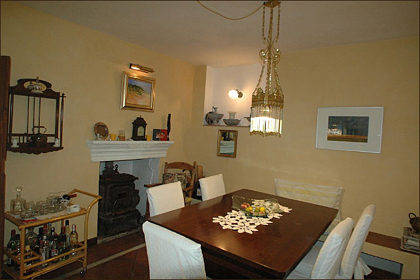 Wood burning stove in dining room. Digital TV ( Spanish ) . WI - FI , Video , Dishwasher, Microwave, Automatic washing machine, Tumble dryer, 2 cots , 3 supplementary beds, Barbecue. Domestic help - 2hrs per day - Cooking and Babysitting by arrangement.